My daughters have a new favorite toy: the Think & Learn Rocktopus™ from Walmart! They had a blast playing and learning with this early Christmas present. 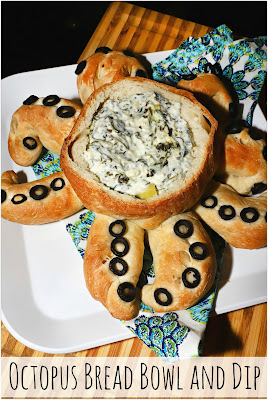 Then we made a fun Octopus Bread Bowl and Dip for dinner inspired by their new musical octopus. My little musical foodies had the best night playing and eating! Scroll down to check out our new favorites! 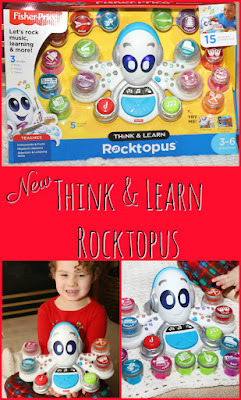 The new Think & Learn Rocktopus™ from Walmart is the perfect gift this holiday season! Rocktopus has 15 musical instruments to help kids learn rhythmic patterns, sounds, explore fun musical facts, and even lets them compose their own tunes! It also has 3 play modes: Math, Music, and Game. Any toy that makes learning fun is a winner in my book! Stella says she wants to get the Rocktopus for all her friends this Christmas! Stella, her sister, and even her Mom and Dad love to learn,sing, and dance with her new Rocktopus! Stella thought this was amazing and hid in her dark closet with her new toy. Also included is a CD to download the free Rocktopus App to create your own music video. Head over to Walmart to purchase your own Rocktopus this holiday season! Now time to make our fun Octopus Bread Bowl and Dip! Remove dough from one tube and form into a large circle for the "head". Place on a greased baking sheet. Remove dough from the second tube cut into 8 portions. Roll and stretch out with your hands into eight "legs". Arrange around the circle "head" on the baking sheet with one side curled up and one side attached to the circle. Arrange sliced black olives on the "leg" dough to look like tentacles. Cut 4 diagonal slashes across the top of the circle dough. Bake for 26 minutes until golden brown. Cut a circle out of the top of the "head" and scoop out inside bread to form a bowl. with one side curled up and one side attached to the circle. Arrange sliced black olives on the "leg" dough. Cut a circle out of the top of the "head"
Scoop out inside bread to form a bowl. I serve warm spinach and artichoke dip. You can use my recipe here: Spinach and Artichoke Dip . How fun is this?! And only 3 ingredients too! I bet your little ones will love this tasty dish and fun toy as much as we did! We have this toy as well, and my daughters love it! How cool you made an appetizer inspired by it! That is such a cute idea. I think my youngest daughter would love the toy and my elder would love the Octopus bread. This is such a fun idea! I bet the kids loved it! !